Fishing Report August 31, 2013 Jeff Sundin - Winding Down On Summer? - With the arrival of Labor Day Weekend, signals of fall are hard to find. Surface temperatures ranging from 77 to 79 degrees greeted us on Lake Pokegama yesterday. The heavy rain and thunderstorms that struck on Thursday, barely left a mark on the lake. There was very little floating debris, typical of a "morning after" on the lake. In fact, except for the puddles in the parking lot, it was hard to tell that the storms ever happened. The outside air temperatures smacked of a cold front in the early morning, but sunshine and calm seas quickly returned us to summer by around noon. I was worried that the storms were gonna make fishing tricky and as far as the Walleyes were concerned, they did. My first hour of fishing was a long one, not much action and not many smiles from the crew, who had arrived with high expectations for an action packed day on the lake. A Lucky break for me, was that my crew was interested Northern Pike fishing too. Equally lucky was that the Pike were showing up in some of their late summer haunts and that they were much more cooperative than the Walleyes. Key locations were deep points in 25 to 30 feet of water. Having weed flats adjacent to the deep points was a key too. Open water humps and bars that did not have weed cover were almost always void of fish. Finding good spots was still tricky, but not impossible. If you're planning to show up at Pokegama, be prepared for a geography test. The more water you cover, the more good spots you'll find. On this day, presentation was all minnows, all the time. I had all three of the crew using Lindy Rigs set up with 1/2 ounce No Snag sinkers. Tipping the hooks with medium to small Creek Chubs (that's all I could get), they caught almost all of the fish. I stuck with Crawlers and sometimes Leeches but failed to catch a single fish for most of the day, until late afternoon, when we ran into a pack of hungry Sunfish. Partly because the minnows were on the small side and partly because the fish were of above average size, the boys didn't need to feed out a lot of line. There were only a couple of missed strikes. If we had larger minnows, or if there were more Walleye present, I would have tried to encourage them to feed the fish longer. There were a handful of very small Walleyes and Bass caught, but without the Pike, this day would have been a struggle. Maybe a day or two of recovery time will help, but I didn't see any compelling reason to high-tail it over there, hoping for a hot Walleye bite. Happily, the crew was encouraged by the cooperative Pike. Smiles emerged as the day unfolded and we have some good memories to look back on. Whew!! That was LUCKY! (8/31) From Wired2Fish; "We are always playing with fishing knots in our bass fishing. Good line and a good knot are the most critical components in how you fish for bass. You can often get away with cheaper lures, rods and reels. But cheap line and bad knots will mean a lot more lost fish and a lot more frustration in your fishing.Don’t skimp and take your... Click To View Video >> Seaguar Knot Great For Leaders . Fishing Report August 30, 2013 Jeff Sundin - Aftermath Of The Storm - I'm expecting to work harder than usual today. In fact, anticipating the bright skies and calm seas, I talked my crew into an early start today. Don't worry, I'll get you caught up on the reports as soon as I get back this afternoon. OH! By The Way, Have A Great Day! :)!! Fishing Report August 29, 2013 Jeff Sundin - My Lucky Day On Lake Winnie! - A reader who visits this page frequently would already Know that I love being a part of nurturing kids into the sport of fishing. But I'll bet that not many have really thought about how fantastic that opportunity is, or the responsibility that comes with it. If everything goes according to plan, we catch a lot of fish, have a bunch of giggles and everyone goes home happy. Mission accomplished, kids hooked on fishing for life. But if things don't go according to plan, the fish won't bite or somebody gets cranky, the whole thing can backfire. Especially these days when there are a million distractions, pulling kids in every direction. If you're lucky like me, then every so often you'll meet a guy like Frank Amore. A typical hard working american who likes to fish and hopes to share the sport with his kids. All he wants is for them to grow into the sport, you know, bring 'em along easy so that one day they'll really enjoy it and look forward to spending time on the water. Frank already knows that the trick is getting the kids "into it", without over-doing the effort and on this particular occasion, he had it thought out really well. First, we'll take 13 year old Isabella in the morning, then after a few hours, we'll come back to the dock and trade for 11 year old Gabe. All I needed to do would be to find 'em something to catch and tell a few silly jokes. To be honest though, I was more than a little concerned. In fact, if you wanted to, you could even say that I was downright scared! After two days of high temperature, high humidity, low action fishing days; The last thing on my list was to go out and ruin Franks dream by dragging his kids all around a hot, sticky, fish-less lake. For the past two days I'd been telling people that all the fish needed was an excuse to bite. We already know where they are, we already know that they're hungry. All we need is a Grey sky, a little wind, anything that would break up the bright sunshine and mirror glass surface and trrigger them to feed. Luckily, we got just enough breeze, just enough clouds and just enough time to pull it off! In the morning, we had a little action on the weedlines by casting 1/16 ounce jigs tipped with 2 inch shad tails. We got a hodge podge of fish that included a Crappie, 2 Sunfish, 1 Walleye, some Pike, Perch and even a Largemouth Bass. There was a lot of potential, but working the jigs in and out of the weeds was a little tricky. So just to make it more simple, I decided to switch gears and troll spinners instead. That's when I really got lucky. Isabella caught on quickly and had a knack for putting the spinner in just the right spot. After catching her first ever Walleye, then her second, then her biggest and then the most, she was given a promotion. Now after being officially endorsed as "Pro-Staff", by the Blue-Ribbon fishing committee, she was asked to direct me to the next location. "Go South", she said, so I went South. That was a good idea, there were Walleyes holding in 10 feet of water along the weed edges and today, these fish were hungry. Trolling at about 1.3 MPH our spinners were getting bit steadily. On this spot, we caught mostly fish in the protected slot, but it was okay, we already had enough for a fish fry in the cooler. On the way back to Bowen's dock, one last pass at "Bella's Bar" would yield another 14 incher, caught by .... Yes, you guessed it. Okay, so now Gabe was in and we were off to the Bena Bar. Luckily, there were some fish out there too and thanks to a Grey sky and just enough breeze to tickle the splash guards, they were on the prowl. Lindy Spinners did the trick here too, trolling at about 15 feet along the top edges of the bar. The action was steady and the mix of fish was good. There were some slot fish, but also a handfull of 16 inchers and a couple of Pike too. It probably would have been smart to just stay out there, but we wanted to check out a couple of weed patches before wrapping it up. Toward the end of our day, the sun came back out and the lake went flat again. The action was over too, but by now it was time to head in and fix our fish fry and we'd had a pretty good day. It was like getting a tap on the shoulder, a final reminder about how lucky I was. We had just enough time to claim victory. And the kids, hooked on fishing for life? Who knows, maybe not just yet, but at least they got a good taste. The seeds are sewn and maybe I'll get a call someday. That would be really good. (8/29) At Lake Winnibigoshish, Joe Thmpson says; "Walleyes still are doing their hide-and-seek thing. The best fishing has been in low light conditions. Trolling #5 shad raps over 12-14' of water has worked. The steam is rising over the river this morning, a sure sign of fall. The fishing will continue toward the fall patterns in the coming days. We have two specials coming up. The first is next week. Reserve a cabin for the week, and stay through Labor Day for free! Also, on Labor Day, our fall special starts. All reservations are 20% off cabin rent. Make your plans and give us a call." >> The Four Seasons Resort on Lake Winnie . (8/29) From the Lake Winnie Region, Nik Dimich says; "Live rigging these spots with spinners tipped with a crawler or minnow has been the ticket to an action bite. Depending on how thick the weed cover is and depth you are fishing, the sinker weight and trolling speed will vary. At a slower speed a lighter bullet or barrel sinker is key, so try a 1/8th ounce sinker and work at a speed around .07 to .08 in shallow. If you go deeper, use a touch heavier sinker 3/16-1/4 ounce and if you are over thick cabbage quicken your pace even though you might think you ... " Read >> Lake Winnie Region Fishing Report . Fishing Report August 28, 2013 Jeff Sundin - On Tuesday, Hot temperatures, sunshine and calm seas persisted and for me, I couldn't have asked for a worse case scenario. Friends of a friend, had gotten all worked up after they had noticed the great Pike fishing that we'd been enjoying a few weeks ago. Hoping to replicate one of those preformances, my assignment was to take them out to cast for big Pike. The plan was perfect, except for one small thing, everything about the scenario was completely backwards. There was too much of everything we didn't need and none of what we really did need. Long story short, except for a few small Pike and a handful of missed strikes, the only thing we were gonna get doing this, was a nice tan. A quick decision to switch over to Walleye and Perch was a good idea. Even though the fish were'nt overly active, we fished with spinners and crawlers in about 10 feet of water and still managed to get enough fish to whip up a decent shore lunch. After lunch, more trolling along the weed edges produced a few more Walleyes, a few Perch and a couple more Pike. Probably not the fishing trip of a lifetime, but we all survived the day and the crew went home with enough fish for a couple more meals. I've seen thougher days before and somehow we always wind up okay. I KNOW from my own experiences that trying to replicate somebody elses good fortune is an up hill battle. First ya gotta' figure out how they did it, then where they did it, then ya gotta hope that the timing is ..... Well, you know, it takes a lot of effort and a healthy dosage of good luck ta boot! Luckily, I also know that persistence pays off and one of these days, the planets will be aligned, the path will be well lighted and the plan is gonna come together. One of these times, we're gonna have a really good day! (8/28) Bemidji Lakes Area, Paul A. Nelson, Bemidji Area Lakes Guide Service says; "Surface water temperatures continue to climb in the Bemidji area with the unseasonably hot weather. Most lakes have surface temperatures in the mid to upper 70s, which are the highest water temperatures so far this summer. The hot weather is expected to continue into the first part of September, so anglers will have to deal with the heat through Labor Day Weekend. This is the last big weekend of the summer tourist season in the Bemidji area. Students in many parts of the country are already back in school, so many families will begin to close up their cabin for the summer. Fishing just starts to improve after Labor Day, with everything biting well in the fall. More anglers are starting to catch on to the fall bite, but there is less time and more things to do, so the traffic on the lakes is still much less than during the summer. Until the fall cool down on the lakes begins, anglers will need to fish in the mornings and evenings for species like walleyes, muskies and crappies. Northern pike, bass, perch and sunfish are all good day biters, so anglers have plenty of options during the day if they are willing to switch species. Walleyes in many lakes have been feeding on the sides of structure, both on the shoreline and on mid-lake structure. Walleye anglers should be able to run their electronics along structure and look for areas with both baitfish and larger marks on sonar. Once anglers find some active walleyes, live bait rigs with leeches, night crawlers or larger minnows have been the most productive presentation. Perch have been active in 5 to 8 feet of water. A 1/16 to 1/8 ounce jig with a fathead minnow is a tough presentation to beat for perch and anglers usually catch a mixed bag of fish." - Paul A. Nelson, Bemidji Area Lakes Guide Service, panelson@paulbunyan.net - 218.759.2235 . (8/28) On Lake of the Woods, Border View Lodge, Mike Kinsella wrote; "It has been a mixed week, we have spread out and covered many parts of the lake. We must be having a photo hangover from the last couple weeks we do not have any new pictures this week, although there were many trophy Walleye caught and plenty to eat were taken. There is still great action along the border 10 miles out of the Lighthouse Gap and all across Big Traverse but as the wind often dictates we found ourselves north of Garden Island as well! Trolling with crank baits has still been very productive and bait fishing remains to be inconsistent. We continue to have the high temperatures up to the 90’s with lows in the 60’s for the week ahead. Fishing Report August 27, 2013 Jeff Sundin - Bathwater Basics - Hot temperatures, mirror flat water and surface temps of 83 degrees was our special treat on Monday. I remember at one point mentioning how guilty I felt; We were out there enjoying ourselves, having a blast by entertaining biting flies, soaking up the hot rays and coaxing fish out of the weeds, one by one. Meanwhile, those other poor people around the lake were forced to do horrible, unthinkable things. Swimming, tubing, skiing we even saw some poor people forced to sit in lounge chairs under shady trees. It was so sad, we could hear them giggling and laughing, doing the best they could to disguise their agony. Nice try folks, but we knew that you were suffering while we had all of the fun. Cutfoot Sioux was an easy read. The flat water made it simple to figure out where there were fish to catch, we could see movement in and among the weeds. There were fish on points and weed edges too, easily visible on my Humminbird. The fish tried their best to help out, biting occasionally. But many of them did what fish do and buried themselves deep inside the heavy weed cover. They were catchable, especially if you're an expert, but that's tricky fishing if you're trying to learn as you go. During the past couple of weeks, my ace in the hole has been Crappies. Now, Northern Pike have taken up residence in many of the weed beds that were holding Crappies. You've heard the stories about somebody reeling in a fish and having it get attacked by a Pike right?. Well on Monday, we had it happen not once, not twice, but three times. In fact, It would probably have been a good time to drop everything and fish just for Pike. My crew got six ice ones to take home without even trying. Just imagine if we had actually targeted them! The problem was that with all of those Pike in the neighborhood, the panfish were holding tight. They were staying out of the danger zone and not giving us much to work with. We did our best work by sticking with the spinners and weedlines pattern. It wasn't fast, but we did manage to get a nice shore lunch, plus a couple of bags worth of fillets to send home with the crew. If you're on the water today and need a strategy to drum up some action, that's probably the best way to go. If was on my own vacation and had the ability to choose what I wanted to do, I'd target something a lot bigger right now. I would seriously think about the opportunities that the warm water could present. Chances of catching Pike, Bass and maybe even a Musky are excellent. Just start by finding good stands of "fishable weeds". By that, I mean weeds that have some gaps and pockets where your lures can be worked without getting choked out by too much vegetation. After seeing numerous Pike attacks on Monday, I'm convinced that you'd have a good chance at a 20 pounder out there right now. If you want to target Walleyes instead, then I think you should look at some of the lakes that have deeper water options. Weedlines in the 12 to 16 foot range, reefs or deep points in the 20 to 30 foot range will produce some fish. On Cutfoot, there were Walleyes holding on a couple of points in the 25 foot range. We didn't try to catch them because the were likely to be "slot-fish" and we were trying our best to target eaters. But for someone looking to CPR a nice Walleye, Lindy Rigging with Creek Chubs could be fun right now too. On lakes like Winnie and Leech, keep the flats in mind too. This is the time of year when schools of fish are prone to be roaming over mid-depth flats in the 12 to 16 foot range. Trolling spinners and crankbaits allows anglers to cover lots of territory will help you find Walleyes and probably Perch and Pike too. For Today - I think we're gonna give those Pike a run for their money! At least I hope so. Fishing Report August 26, 2013 Jeff Sundin - Prowling For Panfish - Turned out to be the theme of our day on Sunday. Surface temperatures approaching 80 degrees can kill the Walleye action. But Sunfish and Bass are prone to be more active during periods of warm weather. Knowing that we were in for a hot day, it seemed like a good idea to get in position to take advantage of these "warm water fish" to wrap up Mike and Atcha Nolan's 2013 fishing trip. Heading for a lake with plenty of Sunfish, a good deep water weedline and lot's of structure would be the perfect strategy, especially for this couple who like fish, any kind of fish. On the water, surface temperatures started at 77 degrees in the morning and would eventually rise to near 80 degrees by 4:00 PM. There was a breeze, but not much and the sky was still Grey from a thunderstorm that had passed an hour earlier. At our first stop, Sunfish attacked our spinners as soon as they hit the water. The fish were holding on the outer edges of a Cabbage patch in about 15 feet of water and if we'd have stopped right there and then, we could have gotten a bag limit without any problem. But at this point, we were still thinking about the potential for some Walleyes to show up in the mix, so I kept on moving. For most of the day, that scenario repeated itself. In fact, until Noon, almost every fresh spot had a school of hungry panfish. They were so aggressive that I eventually figured out the we were never gonna get many Walleyes, because we couldn't keep a bait in the water long enough to find one. That's when I got the brilliant idea to anchor the boat over a deep point, take a breather and just do some good old fashioned fishing. After I had the anchor down, I had planned to get rid of the spinners and rig up some baits that were a little more "panfishy". But guess what? Not only was there no need to re-rig, Sunfish, Largemouth and Rock Bass were loving the spinners fished vertically, as much, maybe even more than they did when we were trolling. At one point, I decided to begin experimenting with other baits. I caught some fish on almost every other bait that I tried. But no matter which little gizmo I tied on, the spinners were outfishing them by at least 2 to 1. We tipped the hooks with worms, leeches, minnows, any tiny morsel of bait we had lying around and they all worked. I even pinched the tail off of a 4 inch Yum Dinger and pinned that on to the hook, they bit that too! The spinners did all of the attracting, the bait just added enough realism to make the fish strike. This pattern, which will last all summer long, can offer fishing as good as it gets, even if you’re new to the sport. Grab a spinning rod and reel, preferably spooled with 6 to 8 pound test, tie on a jig tipped with ... " >> Read Greg's Full Report . Fishing Report August 25, 2013 Jeff Sundin - Winnie Walleye Warming Up, Cutfoot Crappies Catchable and Plenty Of Pike Prowling - That's the word from the pro's on the lake this weekend. For me, fishing plans on Saturday were dicated by the Grand Pooba of of the 2013 Raquet brothers fishing trip, Jim Raquet. Who when given the choice between a mixed bag of Sunfish/Walleye or Crappie/Walleye, instructed me to chart a course toward the Crappie hole. It wasn't a bad decision, shallow water Crappies were cooperative and during the first 1/3 of our short day, kept us fairly busy. Using 1/16 ounce jigs tipped with 2 inch shad tails, we cast toward the weed edges and fished them slowly, using a swim-drop-swim motion. The average size of the fish has been smaller than usual, but weeding through them will yield a catch of fish in and and around the 10 inch mark. After Jim had enjoyed as much Crappie fishing as he could, he instructed me to find some Walleyes. We didn't set the world on fire, but by fishing the weed edges, points and shallow water rocks, we boated a half dozen or so. Cutfoot Sioux gave us mainly "slot-fish" on this trip, but there was news about Walleye fishing coming in from around the lake and fron Lake Winnibigoshish too. Bowen Lodge has a good update about that, so rather than make you read the same stuff twice, I'll just ask you to scroll down and click the link to their fishing update. 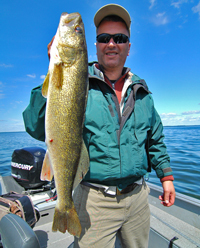 August 25 , 2013 - On Lake Winnie, Walleyes are entering some predictible late summer patterns. Reports coming in from the lake on Saturday indicated some good shallow water action. Deer River area guide Randy Erola was on the East side of Winnie fishing shallow water weeds. Saturday, . Walleyes were cooperative in 6 to 8 feet of water in the weeds. On Cutfoot Sioux, several of the areas pro guides were on the water reporting good Walleye and Crappie action too. According Jeff Sundin, Crappies haven't begun stacking up in deep water yet. Instead, they are locating them in 6 to 9 feet of water by fishing in the weeds. Sundin says that the Sunfish are holding in similar depths, but haven't been stacked up in large numbers. Our friend Jeff Skelly was on Cutfoot this Saturday too and reported good action for ... >> Read Full Lake Winnie Fishing Report . Fishing Report August 24, 2013 Jeff Sundin - Leech Lake Walleye Trickery, or Sucker Challenge? - Will always be the question on my mind when I think about our excursion to Leech Lake on Friday. My good buddy Seymour Sanders from the Leech Lake Campground had been whispering in my ear about the mixed bag fishing action that folks had been having on the North end of Leech Lake. Walleyes, Perch, Crappies and Northern Pike were all active and they were catchin' 'em on spinners. The reports were so good that It tempted us away from our original game plan. My long time friend Pete Raquet and I have had many a memorable day on Leech Lake and this sounded like a great way to kick off our two day stint. So Pete, his brother Jim and their friend Charlie followed me over to Federal Dam to find out for ourselves what was shakin'. On Leech Lake, we found water temperatures pushing back into the 77 degree range and there was an un-expected Walleye chop, caused by a brisk Southeast breeze. Usually, that would have been great news on Leech Lake, but for some reason, it didn't turn 'em on this time. At least not while we were there. Seymour's hot bite had faded, but there was still just enough action to prove that he had been right. It was just that our timing was off on this particular day. We did have some moments of greatness though; Pete caught an acrobatic Pike that jumped right into the net. Charlie caught a really nice Walleye and Jim .... I think he caught something too, I just can't remember what? Maybe Seymour's hot bite was the result of an annual uptick in the action caused by the full moon. Maybe the passing of the full moon just lead to the return of more "normal" late summer patterns. Maybe there was a pressure change or trhe fish were just too well fed today. We'll never know for sure, but they were off their game. Long story short, we picked away at the fish for a good long while, but never really settled into a good bite. We loaded up, took off and dumped the boat back in at Cutfoot Sioux, where we scrounged up a half dozen keepers and a few "slot-fish", not a bad finish. I will definitely be digging into something that I learned or at least think that I learned on this trip. But before I go off on a rant, pontificating about speculations, I'll do a little homework and write it up in a few days. 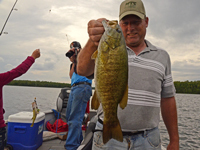 (8/24) At Lake Winnibigoshish, Joe Thmpson says; "The fishing on the West side of Lake Winnie has been very steady. The northern fishermen have done very well using the same old methods. Casting plugs, trolling, and fishing with sucker minnows have all worked very well. The key has been fishing the deeper breaklines which is something that hasn't been done in the past. Normally, you just find a nice weedbed in 7-9 feet and work that. But with the calm days we have had the past four weeks, the fish are much deeper. Yesterday, I had to hold the boat in 17' and cast into 12' to get any action. Even the guys fishing with sucker minnows commented that they had most of their action in 14-16' of water. Perch fishing has been good for the few that have targeted them. They continue to hang on the first main breakline before the main bar. The walleyes still are doing their hide-and-seek thing. The best fishing has been in low light conditions. Trolling #5 shad raps over 12-14' of water has worked. The steam is rising over the river this morning, a sure sign of fall. The fishing will continue toward the fall patterns in the coming days. We have two specials coming up. The first is next week. Reserve a cabin for the week, and stay through Labor Day for free! Also, on Labor Day, our fall special starts. All reservations are 20% off cabin rent. Make your plans and give us a call." >> The Four Seasons Resort on Lake Winnie . (8/24) From the Deer River Area - Brian Castellano checked in with "Mary and I just spent 3 days camping on Namakan Lake in Voyaguers National Park. Being it was our first time ever fishing this lake, I did some research before we headed north. After talking to a few different friends and friends of friends, I had about a dozen "proven" spots marked on my GPS. Too bad only 1 of those spots produced a good bite, but we did have a good bite too right from camp, shore fishing. We graphed a lot of fish in that 25-40' range, but getting them to bite was impossible. Water temps were in the low 70's. So we headed up to a shallow hump (8-10'), rigged up some slip bobbers, jigs, and leeches or crawlers and it was fish on! We caught a bunch of smallmouth and enough walleyes to keep it interesting. Boy those Canadian Shield lake walleyes are dark and pretty! When we were relaxing on our island campsite, we had consistent action w/ the same set up and smallmouth for the most part, but Mary did catch this 21.50" walleye from shore. Fishing Report August 23, 2013 Jeff Sundin - Late Summer Bass Fishing Patterns - Were the focus of my afternoon on Thursday. After a morning of fishing with Spinners for Walleye and Perch, Mike Nolan had the idea that he'd like to do some Bass fishing. That was plenty good news for me, because I don't get to do anywhere near enough Bass fishing and I'll take it every chance I can! When we left the resort, I had a game plan in mind. But for some reason, I happened to ask Mike if he'd ever caught a Smallmouth. Whenever he told me that he hadn't, light bulbs started turning on over my head. Hmmm... okay then, a little detour took me right into one of my favorite Smallmouth lakes and the search began. The story is short because we didn't spend a lot of time there, but we did find some and they were in their classic late summer spots. Rocky patches located on the inside edges of weeds were not only the best locations, they were the only location. Several of the fish were cruising along the breaklines between the weeds and rocks and a few of the fish that we hooked up were actually spotted before we cast to them. Without a ton of time to work with, I went straight to my "go to" Smallmouth bait, a Yum Dinger rigged wacky style. We started with the 4 inch size, but soon figured out the the fish preferred a larger bait. The 6 inch size, Green Pumpkin got a lot more attention, at least on this trip. We're hoping for a little better weather on Sunday and if we get it, there could be more to this story after that. Fishing Report August 22, 2013 Jeff Sundin - Post Storm Cold Front Chilled The Action - But it didn't stop it altogether. When I met my crew on Wednesday, we all knew that fishing action might be a little below average. Heavy thunderstorms rolled through during the night, disturbing the stretch of stable weather that had spoiled us over the past week. The aftermath, clear Blue skies and a cool Northwest breeze felt good, but definitely impacted the fishing action. Luckily, I had been on a couple of good "action bites" over the past few days and felt good about some panfish options. We were able to fish spots that I already knew had enough fish to help us overcome the storm's influence, allowing us to gather fish for a shore lunch. On the water, our first stop was the shallow weeds that held so many Crappies the day before. Surface temperatures had dropped, now down to 77 degrees from the 79 degree reading I saw on Tuesday. It didn't take long to prove that there were still fish in the area, but it was obvious that it wasn't gonna be wide open action. Poking around the outer edges of the weeds with 1/16 ounce jigs tipped with 2 inch Shad bodies still worked though and by 10:30 we had released a bunch of smaller fish and sorted out about 15 keepers to save for a fish fry. Lucky we did, because it wasn't long after that when the action started grinding to a halt. The sun was high in the sky, the winds were calm and the fish were napping. Time for a bite to eat and a switch to Plan B. After lunch, the discussion turned toward presentations. I had one crew member who seemed to be lacking enthusiasm for casting the small jigs. It seemed like taking a spin along the weed edges might be a better match for this one. Trolling spinners had been working well in more than a few lakes, so we just needed to single out the kind of fish we wanted to target. 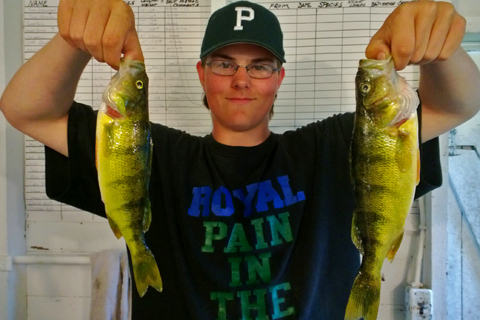 Perch got the nod and Bowstring Lake was chosen as the destination. On Bowstring Lake, Surface water was cooler, hovering at about 74 degrees. There was a wind blowing here and the current forced me to troll with the outboard as whitecaps slapped against the Wave Wackers with authority. Single blade Lindy Spinners, 2 of them tipped with minnows, the other two tipped with 1/2 night crawlers and trolled at about 1.3 MPH got plenty of attention. Pike were holding exactly at the weed edges and the Perch were holding just a bit deeper. The trick was to find the sweet spot where we encountered more Perch than Pike. We needed to be near the weeds, but not in 'em and not too far away either. The key depth for me turned out to be about 7 feet deep. There was decent action, but the size of the fish was below average. We released a lot of fish in the 7 to 8 inch range and managed to sort out about 25 fish that ranged in size from 9 to 11 inches. There were a couple of Walleyes caught, but we only kept one of those and it was probably just crossing the 14 inch mark. The best news was that this presentation was much better suited for the crew member who needed the boost. Plus it helped us gather plenty of fish for the family fish fry. In fact there was even enough for me to come home and fix a second fish fry for visiting relatives who awaited my arrival, forks in hand! (8/22) Good morning Jeff, First off, thanks for all your hard work on your fish reports. They're a boat load (ha!) of information. Q) How do I find out info on some of the photos posted to the left on fish reports. I noticed a bucket full of sunfish and walleyes and it says something about fish this clear water lake for a mixed bag. Is there something I'm missing to find out which lake or is it top secret need to know kind of stuff? Keep up the great work! A) Brad, if I know that a lake can withstand a lot of pressure, then I do try to mention the names. but if a certain lake has a fragile balance that could be upset by too many visits (including by me), or if it's been reffered to me by a friend who wishes me to be careful about over-selling their special gem, then I tend to be a lot more careful. In most cases, I try instead to draw paralells about lakes of similer types. If I give folks some solid information to work with, then I hope that they'll pick up the ball, do some of their own investigating to find a lake where similar patterns that will work for them. I am thrilled that you're a regular reader and I hope that I always give you something to pique your interest. When I can be specific, I will be! (8/22) Complex Walleye presentations get plenty of press these days, but few walleye tactics are as deadly—or as easy to fish—as the simple slip-bobber rig. With a well-balanced float, you can efficiently and precisely suspend mouthwatering live bait in front of hungry ’eyes. Plus, you know exactly when a fish has inhaled your bait. Veteran guide Mike Christensen is a believer. Big time. From his home base out of historic Hunter Winfield’s Resort on the scenic south shores of Minnesota’s mighty Mille Lacs Lake, the jovial yet dead-serious walleye hunter launches literally hundreds of missions onto the fabled fishery with one goal in mind: connect clients with the big lake’s walleye bounty. Read Article >> Wobble Bobber Walleye . (8/22) "Trolling Crankbaits for Giant Summer Walleye" - Learning how to troll crankbaits for walleye in the summer can reap big rewards. Fishing Report August 21, 2013 Jeff Sundin - Full Scale Summer Panfish Action! - When I met Mike and Atcha Nolan at Bowen Lodge on Tuesday, I knew that the only rule was that there weren't many rules. Perch, Crappie, Sunfish almost anything was fair game. As long as I didn't attempt to do any pre-meditated Walleye fishing, we'd be fine. Abandoning my first thought, which had been to head accross country to bag some Perch, I decided instead to stay close to hame and try for some Crappies. Remembering the pattern that I had stumbled into last year, I told the Nolan's that the idea would either be brilliant, or turn out to be a complete flop. Luckily, it turned out to be brilliant. On the water, surface temperatures had risen back into the mid-70 degree range. Depending on the spots and the time of day, we noted temperatures anywhere between 74 and 79 degrees. To me, rising temps should have indicated that Panfish would be active and aggressive. This time the intuition was correct. Just to be sure that I'd covered my bases, we stopped on a couple of deeper water spots that Crappies are likely to inhabit during the fall. It was a semi-successful start to the day. We caught some, but they were few in numbers and extremely fickle. They gave us a short spurt of action, but soon turned negative, refusing to budge another inch. Heading for the shallow weedline, I re-rigged the rods with 1/16 ounce jigs and tipped them with 2 inch action tails. After a brief warm up period, my crew began catching on to where to their jigs needed to be placed for the best results. Just at the edge of the submerged, but visible weedline. If you cast too far itno the weeds, the jigs get snagged, weed covered and become ineffective. Cast too far away from the outer edges of the weeds and the fish don't have enough time to spot the baits and smack 'em before the get out of range. Ideally, what you want to do is land the bait within a few inches of the submerged weeds, let it fall all the way to the bottom and then begin to swim it back towared the boat. That is assuming that you don't already have a fish on the line. Almost any small action tails would have potential. Particularly lures that have lots of wiggle like YUM's 2 inch Money Fry or Wooly Curltail. Baits with more flash like Lindy's 1/16 ounce Whatsit Spin combine flash and vibration and are a good choice too. Water depths depends on the weedline on your favorite lake. Darker water, shallow lakes typically have a shallow weedline in the 5 to 7 foot range. Clear water lakes are likely to have weeds growing into depths of 14 feet, maybe even deeper. If you're not sure about where to start, then try rigging up a single hook spinner and tip it with a minnow or 1/2 Night Crawler. Hug the weed edges, trolling at a speed of 1.0 to 1.4 MPH until you encounter a Crappie, Sunfish or even a nice size Perch. Once you've found a promising area, drop a marker and start working the area more thoroughly with the small jigs. Every once in a while, you'll get lucky like me and stumble into the mother lode. (8/21) Bemidji Lakes Area, Paul A. Nelson, Bemidji Area Lakes Guide Service says; "Surface water temperatures are on the rise again in the Bemidji area, with most lakes in the low to mid 70s. Algae in many lakes are blooming as water temperatures rise, which should move more fish into the weeds. Walleye fishing is slowly picking up in most of the larger lakes. There are basically three patterns walleyes are using in most lakes. Some walleyes are using 5 to 8 feet of water and are feeding in the weeds in many of the same areas as the perch and northern pike. These fish are usually on the move as they follow the food as they get chased around by the pike. Most anglers are using 1/8 ounce jigs and minnows or jigs and plastics to catch fish in the weeds. There is another group of walleyes that are feeding on the breakline that are using the sides of structure, both on the shoreline and on mid-lake structure. These fish tend to be in 12 to 18 feet of water when they are active, which is deep enough for anglers to be able to see them on electronics. Most anglers are using live bait rigs or bottom bouncers and spinners to catch these fish. The last group of walleyes are feeding on the top edge of the thermocline in 25 to 40 feet of water, depending on the lake. Most anglers are using live bait rigs with larger minnows or leeches or using ¼ to 3/8 ounce jigs and larger minnows to catch the deep fish. 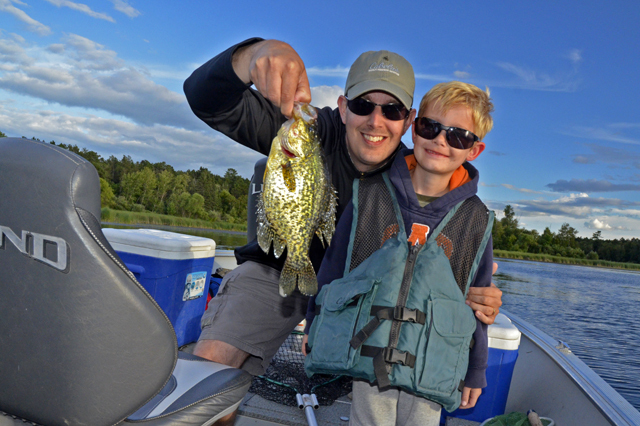 Panfish action continues to be good in many of the smaller lakes. Both the sunfish and the crappies are feeding on the deep edges of the coontail and cabbage weed beds. Jigs and minnows or jigs and plastics are working well for the crappies, while sunfish like small leeches, night crawler pieces or wax worms on small jigs." - Paul A. Nelson, Bemidji Area Lakes Guide Service, panelson@paulbunyan.net - 218.759.2235 . Fishing Report August 20, 2013 Jeff Sundin - Full Moon of August Heats Up The Neighborhood - And the fishing action appears to be warming up too! Big fish, small fish and mixed bag action provides something for everyone. It was my lucky day on Monday. Fishing with Craig Andresen was easier than most of my typical fishing trips. It didn't really matter what we fished for, or where we did it. They'd all be good and as long as he brought home at least some Walleyes, he'd be happy as a Lark. Pokegama was the destination for the morning. Mostly because I wanted to get even with some of the fish who embarrased my crew on Sunday. Surface temperatures had risen to almost 72 degrees and during the early morning, fish were active. Smallmouth Bass, Walleye and small size Pike seemed "ready to rock". But after the sun rose high in the sky and the lake went flat, the action ground to a halt. A hasty escape was in order so we loaded up and trailered the boat up to Lake Wabana. I was confident that Bass and Sunfish would almost certainly keep us entertained as we picked away at the lakes finicky, but catchable Walleyes. On this lake, surface temperatures had risen to 75 degrees and the clear water was tempting me to jump in for a swim. There was barely a breeze, but there was just enough to keep the sweat from running into my eyes. On this day, Wabana dished out a couple of surprises; The Bass appeared to be gone from the outer edges of the weedline. In areas where we had previously been inundated with small Bass, there were only a few straglers remaining. Sunfish were still there though and kept us busy at almost every stop. Panfish on this lake are not known for being gigantic, but they were good enough for us guys. We kept 19 Sunnies that measured between 8 and 9 inches. Legitimate keepers on most lakes. Walleyes were on the weed edges too and typical of recent trips, we were able to count on Wabana to deliver just enough fish to make it a good day. For someone who insists on a full-scale hot bite, I probably wouldn't suggest a trip up there. But if you like the idea of a nice mixed bag of Sunfish and Walleye, with an odd Pike thrown into the mix for good measure this might be a fun day. (8/20) From Wired2Fish; "When the smoke cleared on stage Sunday in the Shreveport Century Link Center, Randall Tharp stood on stage as your 2013 Forrest Wood Cup Champion. He weighed 5 bass for 14 pounds to seal the deal with a four-day weight of 53 pounds, 2 ounces. Tharp exudes confidence when it comes to tough tournaments where " ... >> Learn More Forrest Wood Cup . 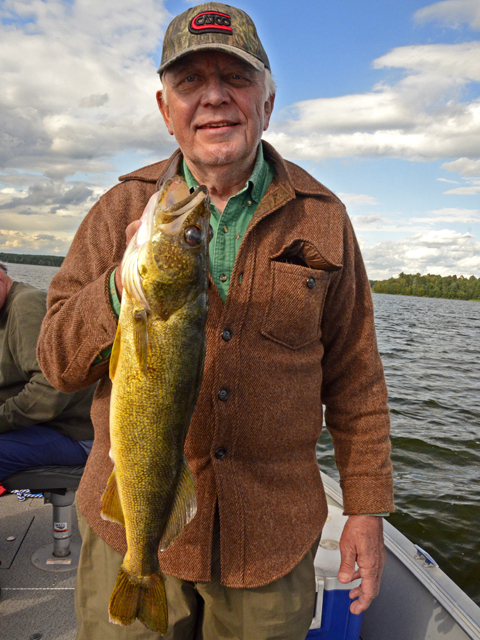 (8/20) On The Iron Range, From Greg Clusiau; "Almost immediately, Tom had a strike and reeled in a nice walleye. Then it was my turn, a nice northern pike. Back to Tom, another nice walleye showed it’s face. Then me, another northern pike. Batiuk laughed over this happening but I didn’t care, as they were nice fish and certainly not the so-called “hammer-handles” they typically weigh in at 2 pounds or so. These were nice fish in the 6-7 pound range. Our search for a big “photo fish” lead us to ... " >> Read Greg's Full Report . (8/20) From the Lake Winnie Region, Nik Dimich says; "Those of you who have been on the North Shore or fished there will know what I mean when I say there is nothing quite like it. Some of my best fishing memories have come from the beautiful spring days chasing steelhead in Lake Superior’s feeder streams and rivers with fishing buddies Mike Glorvigen and Ryan Miskovich. In addition, some of my most interesting fishing conversations have been with the fishing tournament and industry famous and hugely successful Greenway/Grand Rapids twins, Scott and Marty Glorvigen, founders of the" ... Read >> Lake Winnie Region Fishing Report . (8/20) On Leech Lake and the Grand Rapids Area - Musky fishing was okay on Sunday according to Grant Prokop, who said that in spite of the high wind, there was still lots of boat traffic. Prokop, along with most of the Muskie fisherman concentrated on the rocks. They moved 3 Muskies and boated one small one from 5:30 until 11:00 in the morning. After that, they pulled out headed to a smaller body of water in the Grand Rapids area for the afternoon. Prokop says; "We ended up catching 6 walleyes, 4 keepers in about an hour and then went back to chasing muskies only saw one which happened to explode on a top water but missed the bait. (8/20) In the Grand Rapids Area - Jason Alto snuck his kids onto one of his special Bass lakes and found some action. Fishing the weed edges in about 10 feet of water, they found some action and some nice size fish too. Grant Alto pictured to the right, caught a hefty Largemouth using a jig and minnow. (8/20) On Lake of the Woods, Border View Lodge, Mike Kinsella wrote; "The action is still strong! Fishing in Big Traverse has been paying off! We are still on the plug bite and the big Walleye have been active. We have been targeting areas along the border from the Lighthouse Gap out to 33 feet of water. With so many pictures this week there is no need to get into much detail. Come on up and get in the action! The forecast is looking a little warmer for the week ahead. High temperatures are supposed to be in the 90’s with lows in the 50’s. Winter rates are out. Check out our website and give us a call. Don’t get left out in the cold!" 1-800-776-3474 Border View Lodge . Fishing Report August 19, 2013 Jeff Sundin - Happy Monday and HEADS UP! I've been working on logistics for a few special fishing projects and as we worked out the details, I've been sitting on some open dates. I'm gonna publish the list of all remaining open dates for the 2013 season in the next day or two. Subscribers to the "Insiders News" can expect to see a list of open dates for the rest of this season. If you're not on the list and want a peek at the dates, you can click here to get signed up to the >> Fishing Guides Insider News . On Pokegama yesterday; The only word that I could think of that describes our fishing trip was calamity. It was just one of those days that didn't work out the way it was supposed to. The whole day reminded me of a slow motion version of the feeling you get as you're tripping over your own shoe laces. We got plenty of chances, the fish didn't bite all that much differently than they did the last time that I was there. It was just that this time, we missed 'em, lost 'em and broke 'em off at the boat. Except for a few, we just couldn't get the fish from the water, into the net. Nobody was mad, no one broke their rod over their knees, nobody swore off fishing for the rest of their life. It was just one of those days. We'll try it again next summer and next time, the story will be a lot more fun to tell! Fishing Report August 18, 2013 Jeff Sundin - Spending the first week of August fishing mostly for Pike and Muskies. Then being way for 5 days fishing in Canada, I was feeling a little bit out of touch. Fishing news around here had been quiet while I was away and I had a feeling that I might have to work my way through a slow morning while I worked my way back into my routine. Luckily, my return to the "real world" on Saturday turned out to be better than I expected. Thanks to some clues given me by three of my fishing buddies, I had a head start. Knowing that there had been a little bit of action on Bowstring Lake, I decided to start there with the notion that we could drum up a mixed bag of Perch, Pike and Walleye for lunch. We could always switch lakes after the trrops were fed, if we needed to. On Bowstring Lake, there was a brisk Southeast wind and the water temperatures ranged from 69 degrees on the low end, up to 71 degrees in Muskrat Bay. Except for the most protectred areas of the South shoreline, whitecaps covered most of the lake, even what was supposed to be the calm side. That turned out to be good news for us. Fish were agressive and getting then to strike a Lindy Spinner tipped with night crawlers was fairly easy. I just needed to stay on the weed edges in about 7 feet of water. My best results came from staying close to the edges of the heaviest patches of Cabbage weeds that I could find. The spinners attracted Pike and Perch better than they did Walleye, but we did bag enough Walleyes to keep the process interesting, especially during the morning. After lunch, the Pike kicked into high gear, biting so fast that it made knowing whether or not there were Walleyes in the area difficult. Walleye location was spotty, with certain weed beds holding small schools of fish. Pike and Perch covered a lot more range though and finding either of these was simple. Crappies didn't figure into our fishing trip at all, but my friend Robby Ott, Otter's Guide Service was on the lake and he did locate a school of them. The Crappies he found were in deeper water, somewhere around 13 feet, but I don't know the precise location. Robby does though and I'd bet that if he has an open date, he'd be willing to take you there. 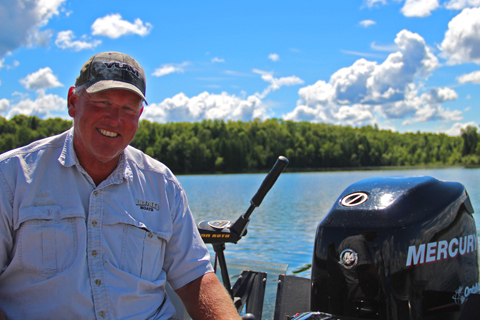 Fishing Report August 17, 2013 Jeff Sundin - Don't look now, but after a nice visit to Ontario's, Lake kashabowie Lodge, we're back and happy to be home. The fishing was good, the weather was good and spending time with this group of friends could not have been better. For five days, there was never a cross word, never and eye-brow raised, not a moment of stress. Good sports, one and all. I'm back on home waters this morning, so you can look forward to an update on Sunday. For now, I'm heading out to see what's shakin' on the lake. Fishing Report August 12, 2013 Jeff Sundin - Sundin Visits Canada - Don't look back, but the US Flag is in our rear view mirror. Just a few days while I visit the Canadian side of the border for my first ever, open water canadian fishing trip. I Know, if you waited this long, why go now? Because I need to get a picture of a Maple leaf! HA :)!! See You in a few very short days! (8/12) From Wired2Fish; "Bank fishing is what taught many of us to love fishing as children. Speaking personally, there was always something transcendent and pioneering about dodging ant hills, chasing thirsty cows out of my honey holes and catching unsuspecting bass without even needing a boat. As I write this piece today, those boyish feelings haven’t left me ... " ... >> Learn More Bank Fishing, 5 Tips . (8/12) A few days ago, my buddy Dave Hernesman gave me a heads up about a water conditioner that he's been using in his minnow tank. He told me that it's really been helping him keep his bait supply healthy. He showed me a bottle of U2 Pro Formula Live Well Treatment and he said it's been working like a charm to keep his Redtails and Creek Chubs alive and kickin'. That's big news because cash expense aside, good minnows are just plain hard to come by these days. When you do get your hands on 'em, the last thing you want to do is watch 'em die! At first, it looked like it might just be another version of some of the other additives that I've already used, but he sent me home with a sample and told me to give it a test whirl. It wouldn't be fairt to tell you that i'm an expert on this stuff. But I can tell you this; After 2 days in the cooler, my test batch of 2 dozen Creek Chubs was still alive, swimming strong and ready to get after some fish. This morning, the water is still clear and there's hardly any foam or scum built up on the upper walls of the cooler. I have a feeling that this stuff is gonna work out really well. I'll be keeping posted, but in the meantime. I'm not sure if he's got supplies currently on hand, but I'm sure that he can help you find it. Just click this link to shoot him an email at >> Rays Marine and ask about U2 Pro Formula Live Well Treatment. (8/12) Lund Boats Catch of the Year! - The wait is over! Catch of the Year is here! Now thru Oct. 31st, customers can reel in the savings on various 2012, 2013, and 2014 Lund models. Not to mention, select models receive a free Lund travel (cockpit) cover. Click to Learn more about >> Lund Boats Catch Of The Year " . Fishing Report August 11, 2013 Jeff Sundin - Stabilizing Weather, Fishing Patterns Predictable - During late summer, if you wake up to a crisp, cool morning, with bright blue skies and no breeze, you should know that it's gonna be a trricky day to fish. Especially if it's on the heels of a major cold front ripping through. Like the one that blew through on Friday, leaving behind turbid water and falling surface temps. But if YOU KNOW that, then YOU KNOW that the same crisp, cool, morning is moving us in the right direction and that it marks the beginning of the next rebound. This phase of the seasonal cycle means that good times are on the horizon. Nature is moving us along the path and all of the critters are gonna be making some predictable moves. Take yesterday for example, our goal was to try and bag a big Northern. But before we even got to the lake, we already knew that we'd have a tough time getting them, especially by casting. We'd need to hustle onto the water as fast as we could if we wanted to get some decent Pike before the Sun rose too high. We were right, we got onto the lake and had an immediate flurry of action. It was short-lived though and well before noon, we were already into scrounging mode. Picking away at fish that we knew "were there", but just not active. We stuck with it though, sifting through the weeds, chipping away at the fish. But by lunch time, we knew that "Plan B" was in the future. After scrounging around, picking up a few Crappies, a few small pike and a stray Walleye. A pattern started emerging. There were Walleye and Pike mixed, most of them tucked into small, inside corners on larger, shoreline related points. I was marking most of the fish in 25 to 30 feet of water, adjacent to many of Cutfoot Sioux's most popular fishing spots. The fish weren't up in shallow water though, they were over the edgers, in deep water. One we had a school of fish pinned down, we had a fairly easy time getting them to bite. But a a little string of un-lucky line breakages allowed the majority of them slip through our fingers. Not all of 'em though. Lindy Rigs tipped with medium size Creek Chubs was a reliable way of getting fish on the line. So was a Lindy Rig with an air injected Night Crawler. I know this will sound silly, but it's really true. There were times that we could actually smell where the fish were. The flsh that were feedintg, were feeding on Tulibees and aroma of fish oils rising to the surface was un-mistakeable in certain areas. At one stop in particular, Kristin said; "There are fish down there and they are eating things". She was right. By late afternoon, we'd had a few giggles, our confidence was bossted and we were ready to take on the weeds, casting for some more Pike. The later it got, the better the action became. But at 7:30, the Sunshine was still bright, the sky still clear and the evening bite was just beginning to take hold. By then, even though we knew that the best was still to come, the crew was ready for a break. So we headed out, mission accomplished, at least in part. So what have we learned? If you're planning to fish shallow water weeds, especially for Pike, then early and late in the day will be your best bet. If you're gonna be searching for Walleyes, keep in mind those off-beat, deep water structures that many of us forget to check out. Fishing Report August 10, 2013 Jeff Sundin - Crazy Weather Makes Life Interesting - I'm not too sure what to tell you about Friday. We spent our day on Lake Winnie and Cutfoot Sioux and there were fish to be had, for those willing to work for them. We really had our hearts set on casting for Pike, but getting some fish for the camp fish fry was important too. There was an idustrial strength, Northwest wind gave me a moment of pause and it seemed like an excuse to go searching for Crappies for a bit in the morning. We did find a few, but between the whitecaps and the finicky bites, it didn't seem like it was going to stack up into a big deal, so plan B, here we come. After getting a heads up from my buddy Jeff Skelly, we knew that there were some fish hitting on Lake Winnie and we knew it would be rough, but manageable. On the big lake, surface waters had given up another battle to this most recent cold front, dropping another point. Now pinned at 68 degrees, surface temperatures are starting to remind me of early fall, more than late summer. We stopped along the North shore, where the evidence of baitfish, Pike and Walleyes is overwhelming. The outer edges of the weeds are loaded with Tulibees, small Perch and who knows what else. I do know that the screen of my Humminbird is lit up like a Christmas tree, the flats are teaming with life. Casting was going okay, but not great. By now it was getting late in the morning, the fish were snipping at the baits, but not taking hold and it seemed like a good time to try for Walleyes instead. In true "Wrong Way Corrigan" fashion, I managed to get on the bandwagon just in time to watch Cubby catch the last two or three fish that were left on the flat. We watched him leave with the bag, but we were left holding the bag. Hmm.. we tried trolling spinners on a couple of more spots, caught a ton of small Perch, one slot size Walleye and a couple of little Pike. We went back to casting for pike just in time to see the beginning of an uptick in the action. The late afternoon, early evening bite was beginning to settle in and as the action began to pick up, the size of the fish was improving as well. The only problem was that the camp director had obligations back at headquarters. In other words, we left before the bite got really good, but there were definite signs that it was going to improve during the evening. By days end, we had managed to accomplish the primary goal, get meat for Camp Hastings. But, it was a work day, putting one foot in front of the other and gathering the fish one by one. Presentations were the same as they have been all week long. The 5 inch Money Minnows continued to produce Pike and for the guys who found 'em in time, Lindy Spinners tipped with a half crawler produced Walleyes. The Crappies that we'd caught earlier, were taken from shallow water on the weed edges using 1/16 ounce jig heads, tipped with 2 inch white plastic tails. Fishing Report August 9, 2013 Jeff Sundin - Two Toothies, for Two Guys = Too Lucky! - Well, when Bob Churack and I were chatting about my work assignment for Thursday, catching a lot of fish never entered the conversation. Bob was was kind of curious about learning something on the lake he lives on. I was too, because nearly 30 years ago, when we moved into this area, this was literally the only lake I knew anything about. I thought it would be an interesting challenge to see if we could drum up some action on this fickle little lake and so the plan was set. When we met at the ramp, we still didn't really have a fishing plan, we'd just poke around a little and see what we could find. I suggested that we try casting for Muskies while it was still early, just to see if they might be active. Well, Bob saw one at the first stop, the second stop, the third .... Oh No, I interrupted the flow at the third stop by catching a nice Pike. Trying to spend as much time as possible fishing parallel to the weed edges. We were drifting with the breeze, casting toward the weeds, then quartering our lures back toward the boat. The hefty 38 inch Pike snapped up my 5 inch Money Minnow along the outside edge of the weeds over about 25 feet of water. We saw another nice Musky after that and then two more small ones at the next couple of stops. If I'd have been really smart, we would have just kept on fishing for toothies all day long, but hind sight is 20/20. After lunch we explored a few spots, checking to see what we could find. Tolling spinners on the weed edges produced some panfish, a few better than others, but still mostly small ones. There were some small Bass too, but there wasn't anything too interesting about them either. It was beginning to look like the day was gonna end quietly. Around 4:30, a tap on the shoulder reminded me to go around the corner and check out a little weed point. Yeah, I remember catching some fish there before, let's try that. Well, there were a couple of more small Bass, some Sunfish and WHAM! Some big critter came along and snapped at Bob's Lindy Spinner while he was reeling it in. "A Musky just crabbed my spinner", he said. I handed him a rod that was rigged with a plastic creature, but that didn't get Mr. Big's attention. Well, if he snapped at the Lindy Spinner, maybe we better try another spinnerbait, so I handed Bob the rod that was rigged with the White and Grey M&G Tandem bucktail. One cast and that fish was hot on the trail, snapping and churning the water as Bob gave it the figure 8. Still, the fish gave up and it looked like it was over for the day. One more cast and ..... oh look, that's Bob holding it up for the camera! Oh and by the way, Mr. Prokop, I'm not envious any more, not now that we got that out of our system! :)!! Fishermen are optimists by nature, if we weren't, we'd never take a chance on trying to catch anything. Luckily, It doesn't take non-stop action to keep guys like Bob interested. Luckily he hung in there and kept on trying and luckily, this time, there was a pay-off. Ya gotta love an optimist! Bob and I are gonna turn out to be good friends, just wait and see. Fishing Report August 8, 2013 Jeff Sundin - Post Cold Front Conditions Yield Odds and Ends - Talk about a mixed bag; Wednesday's fishing trip yielded a hodge podge of fish ranging in size from about 3 inches to 30 inches and everything in between. Just not a lot of any one kind and not all in one place. Northern Pike, Bass, Walleye and panfish all acted the same way, get close enough, show 'em your best presentation and then they'd bite. Don't make any mistakes though and don't spend too much time in the same spot. In fact, don't even spend too much time on the same lake. I made a day out of it by switching lakes 3 times in the same day, just to put our lures in front of enough active fish to keep it interesting. I switched rods and presentations even more often than I switched lakes and every time we tried something different, we caught a few more fish. Sometimes changing the presentation changed which species of fish we caught and sometimes it didn't. My Money Minnows caught some Pike, but they caught quite a few Bass too. My Musky size M&G Bucktails caught more Bass than they did Pike and my plastic worms hardly caught anything. Our spinners tipped with minnows caught mostly sunfish and my Crappie jig tipped with a 2-1/2 inch Money Minnow caught Walleyes. In other words; The pattern was that there was no pattern. The only thing that every spot, on every lake had in common was weeds. No Cover = No Fish, at least for us. I don't mean to make it sound like a bad day though, it was actually fun moving around the way we did. There were moments of glory too; Some of the Bass and Pike were nice size fish and the Sunfish made us giggle at just the right time. (8/8) A quick note from Bill Powell at Fred's Bait in Deer River; "Its getting that time of year when the big fish really start showing up and weve been able to put some nice fish in the boat the last few outings. If the weather dont get to goofy the next 2 weeks youre chance at a big fish should be prime." - Bill Powell, Fred's Bait Deer River . 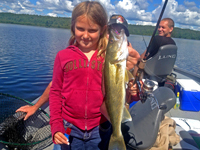 Fishing Report August 7, 2013 Jeff Sundin - Northern Pike Fishing Trip Becomes Walleye Bonanza! For first time Walleye fishermen Brian and Brian Wiese of Nashville, TN . When I picked the boys up at the motel on Tuesday morning, the plan was to go out on a limb today. We'd try to find a place where we could try to catch Mr. Big today, with the idea that if that failed, we'd still have Wednesday to stage an eleventh inning rally. Luckily, we had the rally first, even if it is going to ruin these two for life. Our actual goal was to zero in on some larger than average Northern Pike. We'd try to find some of them on deep structure using large minnows. That way, if there were some Walleye or Smallmouth bass on the prowl, we'd have a chance at catching a few of them too. I'm not sure that either of the two Brians realized what was happening on this, their first ever Walleye excursion. But somehow, I stumbled into a hungry school of big Walleyes. Pokegama Lake was giving these rookies, the kind of Walleye fishing that many veteran anglers have been dreaming about, but have never achieved. Six pounders, seven pounders, eight... nine... It was just one of those days, just a lucky guess at a couple of lucky spots. We found the fish in 25 to 30 feet of water, off the tips of mid-lake bars and our best presentation was Lindy Rigs, 3/4 ounce No Snagg Sinkers and lively Creek Chubs. Our trolling speed was .6 to .8 MPH. We had to feed the fish a lot of line and it's fair to say that we lost more than we caught by not always getting the timeing right. But the end results were more than acceptable, you could even say that they were good! (8/7) From Wired2Fish; "Haven't you ever wanted to fish on your own, private lake, managed "just the way you want it?" Terry and Jason got the opportunity to visit a private lake to bass fish on a cool summer morning. The tried frogs, buzzbaits, swimbaits, jigs, plastics, crankbaits, and more and caught a lot of small bass. But they made a change with a weather change and really caught them after that. Proof that a healthy privately managed fishery can" ... >> Learn More Fishing A Private Dream Lake . (8/7) At Lake Winnibigoshish, Joe Thmpson says; "For some unknown reason, the walleyes decided to bite today! Trolling shad raps on the flats seemed to be the ticket. The same presentation has been used for the past two weeks with limited results, but today was the day. The perch that had been biting in those areas hid for cover as the toothy critters took their place. I can only assume that the young of the year perch have finally migrated to their normal haunts for this time of year. The perch fishing is definitely starting to be what it should be with the fish starting to show up in the normal shallow weed spots. I fished yesterday morning and caught a limit of nice perch in the weeds in 5-6' of water. Jigs and minnows were the preferred bait. The west side of Winnie has been producing some really big Northerns this past week or so. We also caught some nice northerns trolling an old time bait: the Dardevle. Trolling at a little over 3mph with the larger troll-devle was the ticket. We boated over 20 northerns in a few hours using this presentation. We ended up keeping nine nice ones between 24-26". There is still time to take advantage of our Fishing Report Special for next week. We still have cabins available. If you want to get away with your family and do some fishing before school starts, you will never get a better deal. Give us a call. Mention this fishing report, and get 25% off new weekly reservations August 10-17! >> Click here to check our availability << or give us a call and take advantage of the best special of the year!" 218-665-2231 . The weather is cool and and it is great sleeping with the windows open! Give us a call ... >> The Four Seasons Resort on Lake Winnie . (8/6) Bemidji Lakes Area, Paul A. Nelson, Bemidji Area Lakes Guide Service says; "Lakes in the Bemidji area continue the fall-like cool down, with surface water temperatures falling into the 60s in most lakes. Walleye fishing continues to be slow in most lakes, which is surprising with the cooler water. Most anglers expect the walleye bite to pick up very soon if the cooler weather pattern persists, which is what the extended weather forecast is predicting. Anglers fishing in the Bemidji area are still finding good fishing for species like perch, largemouth bass, northern pike and sunfish, which have all been biting pretty consistently. On the other hand, walleye fishing has been spotty, with a good bite for short periods of time when the conditions are perfect and tough the rest of the time. The best walleye bite had been on Winnibigoshish, but that has slowed down recently too. Lake of the Woods continues to have the hottest walleye bite within a day-trip driving distance of Bemidji. Anglers’ best hope is to find a school of walleyes with their electronics in deeper water and make several passes with different presentations until they find something that triggers a few bites. The other option for walleye anglers is to take the multi-species approach and take a jig and minnow into shallow water and fish for perch and be happy to catch a few walleyes and northern pike as a bonus while targeting the perch. 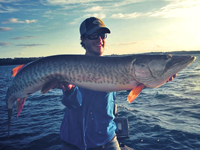 Muskie fishing continues to be tough in most lakes. Muskies make fewer mistakes when they are able to see things so clearly. Anglers’ best hope is to put lures past them at times when they are harder to see, so a musky is more likely to make a mistake. Crappie fishing has also been tough during the day, with crappies moving into the weed beds right at dusk. If anglers can figure out where the crappies are feeding, then they just have to be there at the right time." 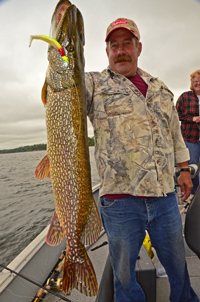 - Paul A. Nelson, Bemidji Area Lakes Guide Service, panelson@paulbunyan.net - 218.759.2235 . (8/6) On The Iron Range, From Greg Clusiau; "I drove up to Ft. Frances and met up with “the Manitou expert”, Tom Batiuk, who fished the big water as many as 26 times one season. Batiuk’s season of 26 trips to Manitou resulted in 177 trout. Tom said the fish averaged 6-8 pounds and over the years he has caught three 17 pound fish, much like the one I lost on this trip. We didn’t see it but it was BIG and not wanting to come off the bottom. Eventually it got wrapped around the down-rigger cable and ... " >> Read Greg's Full Report . 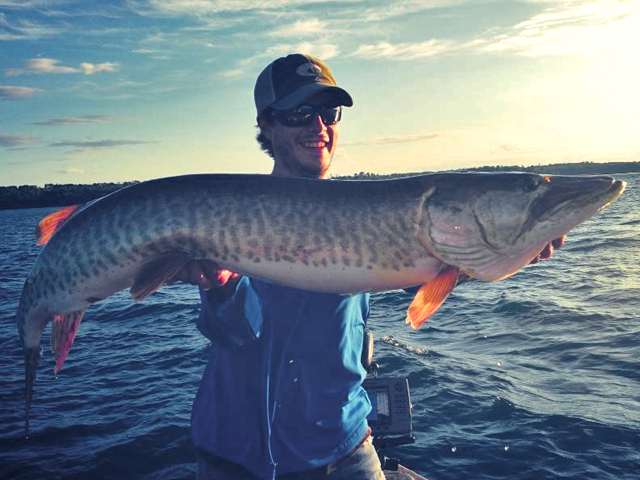 (8/6) On Leech Lake; My buddy Grant Prokop has been having a blast, enjoying great Musky fishing. He's been sending me a picture of another one, sometimes two almost every single day. The fish are cooperative, but if you're going to try and bag one, forget about fishing during the daytime. A better plan is to spend some time working for Walleye or Perch during the day, and then saving the last couple of daylight hours for Muskies. 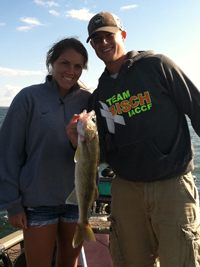 Prokop said; "Got on the lake at 6:45 PM and didn't move a fish until the last hour of daylight. Hooked one fish on a figure 8 and then caught a 45 inch fish about 15 minutes later." Fishing the day before, Prokop commented that finding weeds was tough in his favorite areas. Instead, he focused on fishing rock bars and humps. Comparing notes with anglers and dock hands at the resort, the consensus is that Muskies are solidy in the "evening pattern" right now. Start your day late, stay until dark and work the rock bars. 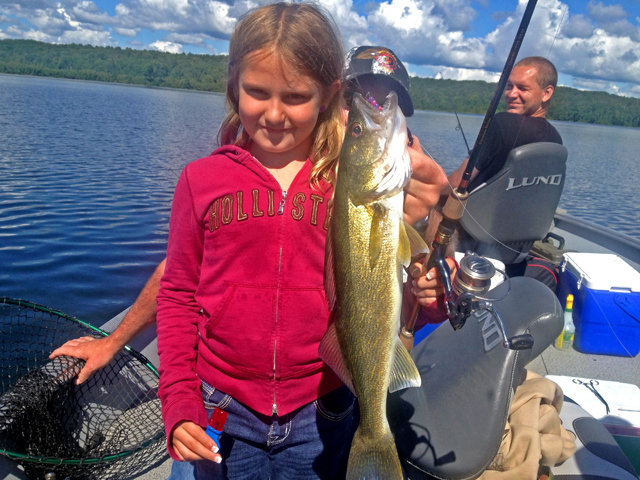 (8/6) On Lake of the Woods, Border View Lodge, Mike Kinsella wrote; "The big girls are biting! Lots of 28 inch + walleyes are being boated. Schools of nice walleye are on the move in the middle of Big Traverse Bay, 9 to 14 miles north of Pine Island. Pulling plugs has provided the best results, but spinners and jigs have also been working well at times. The cool, comfortable trend continues this week with highs in the mid 60s and low 70s. It’s great weather for fishing. There is still time to book your trip before the summer ends. Our charter captains are eager to put you on some big walleyes! Winter rates are out. Check out our website and give us a call. Don’t get left out in the cold! " 1-800-776-3474 Border View Lodge . Fishing Report August 6, 2013 Jeff Sundin - Pike and Crappie Mixed Bag! Another lucky day on the lake began with a dry morning on Monday. After a stormy night, it looked like we might be spending a day in the rain. Somewhere along the line, the rain clouds failed to get the memo and except for a few drops at lunch time, it was a dry day on the lake. The storms that passed though to the edge off of the fishing action, but didn't stop it completely. By working a little harder, we managed to get good results casting for Pike again. Especially George, who seemed to wind up in the right spot every time he casted. In terms of presentation, we didn't do anything differently than we had on Sunday, so you can get all of the details by scrolling down the report from August 5th. Our top presentaion was still YUM's 5 inch Money Minnow, rigged on a 1/2 ounce exposed jig head. After a rest stop for lunch, we shifted gears and slipped into the Crappie hole. With surface temperatures still holding at 70 degrees, I believe that most of the Crappies are still on the weed edges and feeding in their routine summer pattern. There were a few fish beginning to school up though and I did locate one small pack of fish in 18 feet of water. There were just enough fish in that school to pull out 20 fish for my crew before the action fizzled. Many of the fish were running a bit small, but in a pinch, they'd be good for a fish fry. Average size was about 9-10 inches, with an occasional 11 inch fish thrown in to keep it interesitng. It was hardly the full scale fall bite that we'll be seeing in the near future. But it was a nice sample of what lies ahead. The only way we fished was using 1/16 ounce lindy jigs tipped with a variety of artificail baits. Minnows worked too, but they were no better than the plastics, so we saved time by leaving the minnows in the cooler. 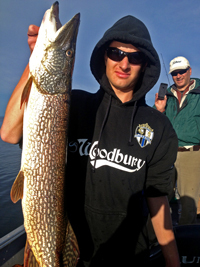 Fishing Report August 5, 2013 Jeff Sundin - Toothy Critters Are On The Prowl! And luckily, Sunday was the day that "We'd Be There, To Do That". When you're chasing big Pike and Muskies, timing is everything. They come and go on their own schedule, and unless you can be out there searching for them every single day, it's a crapshoot whether or not they'll be in "feeding mode" when you try to catch one. I AM out there every single day and most times, I still miss out on the best opportunities just because I'm typically fishing with folks who aren't "In To" fishing for toothy critters. So even though I might have an educated guess about where and when to find 'em, I still rely on good luck, hoping to be at just the right place, at the right time. Well on Sunday, I wound up with the right crew, at the right time and at the right place. It just worked out to be one of those "Lucky Days". The Bieglers and I had never met. But when Bob contacted me and mentioned that his boys wanted to cast for big Pike, I was chomping at the bit to find a way to take this trip. Thanks to another one of my very good, very generous fishing customers, I was able to juggle dates and fit this one in. When I met the boys, it was 41 degrees outside and they were standing in the morning fog at Tamarack Lodge, near the dam on Lake Winnibigoshish. Once we got the boat ready, we had a little chat about where we'd go and what we'd do and then we were off, headed through the fog, toward the deep weeds near Stony Point. As we moved across the water, I noted that the surface temperature now solidly pinned at 69 degrees, had stabilized. In spite of cold overnight air temperatures the lake water has gone as low as it can until we get some really cold daytime temps. I mentioned to Bob that it was anyone's guess how this would affect the fish, we'd just have to get out there and see. As we pulled into the deep weeds, the screen of my Humminbird was alive with life. We could see baitfish, small fish, big fish and everything in between. All I remember saying was the the screen looked good and if we were lucky ..... Game On! If it was a TV Show, the scripted conversation could have gone something like this .... (Son) I'd be happy if I could get a 30 inch Pike. (Dad) well I got one, it's 31 inches. (Son) Yeah but mine is even bigger, it's 37 inches. (Other Son) Yeah but did you see the monster that just got off of my line? It was even bigger than that, over 40 inches and it jumped two feet into the air! (Dad) Yeah, but you didn't catch a Musky, did you? I did! (Son) No, but my Pike is still bigger than your Musky and I caught more of 'em too. (Dad) I know but look at this, it's not every day that you catch a 27 inch Walleye on a spinnerbait ... and you get the idea. It was just one of those lucky days. The fish were holding in about 12 feet of water, on a large flat of mixed weeds, predominantly Cabbage Weeds. During the early hours, we could see some of them hitting the surface as they were feeding. The surface activity decreased as the sun rose higher in the sky, so did our fishing action, but even by Noon, we were still catching an occasional fish. After noon though, the sunshine, calm seas and clear water finally got the best of us and the action would be mostly over until later, when the evening bite would likely start up. We found some fish in shallow weeds too. In fact, at one stop near Highbanks, in 6 feet of water, we saw massive schools of Perch in the weeds and sighted 2 more Muskies, one of them was enormous. This weedbed produced a couple of phantom Walleyes too. A 27 incher and a 25 incher. One caught on a spinnerbait, the other caught on a Rattle Bait, Cotton Cordell's Super Spot. Our top presentaion was YUM's 5 inch Money Minnow, rigged on a 1/2 ounce exposed jig head. I'm not sure if there was really a dominant color, because in the process of consuming my entire supply, I was rigging them up in whichever random order I dug 'em out of the bag. We caught fish on all of them, but one time, I thought that the clown color was working best. Spinnerbaits weren't far behind though and these produced some good fish too. A 3/8 to 1/2 ounce spinnerbait in Yellow/Lime or Yellow/White would be a good choice. We did not add trailers to the spinnerbaits and the fish didn't seem to care. It wouldn't hurt to add a white trailer, just to give the baits more bulk. Like I said, it was just one of those days, we just guessed the right moves at the right times and it worked. There's a fairly good chance that these fish will linger for a while now, so if you've been thinking about doing some Pike and Musky fishing, I sure hope that you can find a seat on the bus and get out there! Fishing Report August 4, 2013 Jeff Sundin - On The Prowl For Mr. Big! I AM So Lucky! Just when I got the itch to forget about Walleyes and go after something big, along comes Mike Biegler. he tells me that his boys wanna cast for big fish and he tells me that they wanna start at 6:00 AM. Well okay then, off we go! I'm afraid that's gonna throw the fishing report off a little bit today though, so please do me a favor and check back this evening to find out how we do. Oh and By The Way, Good Morning! .... :)!! Fishing Report August 3, 2013 Jeff Sundin - Plan B Pulls Through In A Pinch! I AM So Lucky! When the going gets tough for Walleye fishing, Crappies come to my rescue! The Snyders have been heading into the Northland to fish with me for a long time; We think darn close to 30 years now and as nearly as any of us recall, this was the first time that the "Snyder Affect" didn't get kick in to magically bring Walleyes to our boat. Luckily, some delightful Crappies showed up as stand-ins to keep our minds occupied while the Walleyes are off doing their thing. Late summer patterns have taken hold in Little Cutfoot Sioux and it couldn't have come at a better time. We tried fishing for Crappies in their fall haunts, deep water where they begin to school up. They weren't really stacked up out there yet, but we actually found a few. The problem was that they were finicky, particular about how they wanted the bait presented and in our boat, 50% of the anglers caught on, 50% didn't quite make the connection. The surface temperture in Little Cutfoot was 71.5 degrees, steady. That seemed a bit too warm to have encouraged the movement of fish very far away from the weeds. Remembering my experiences from last summer, we headed toward the shallow water and started casting toward the weeds. At first, we caught more weeds than we did fish. In fact, we may have even caught more weeds than we did water. But, eventually the plan started coming together. Crappies of all shapes and sizes began showing up a few at a time. There were little flurrys of action whenever I'd stumble into a fresh pack of fish. Experienced Crappie fishermen would have caught more, but remember, this crew hadn't ever done this and it took some time to get the feel. Fishing in water depths of 5 to 8 feet, we cast 1/16 ounce jigs tipped with plastic tails toward the weed edges. Presenting the baits by letting them fall, swimming them back toward the surface and then letting 'em fall again. The fish especially liked seeing the baits as the fell and that's when we got most of the strikes. So the only real trick was to get away from the idea of finding the bottom, trying insted to keep the jigs about midway between the surface and the bottom. Small action tails like YUM's 2 inch Money Fry or the Panfish Size Wooly Curltail are perfect for this kind of fishing. There were times that we didn't need to cast the jigs in order to catch the fish, all we needed to do was drop the jig over the side and hold it still. We didn't change the jigs when we did that, but for vertical fishing, you could use something like a Fuzz-E-Grub instead. The Maribou feathers have their own built in breathing action aand aren't dependent on swimming to make the tails work. You could just use a plain jig, tipping them with small minnows, but the plastic tails will catch plenty of fish and help save a lot of valuable fishing time. So I guess that at least temporarily, the Snyder Affect torch has been passed along to Nils. This time in the form of a horseshoe shaped like a Crappie. For 2014? Well, we'll have to see about that. August 3, 2013 - On Lake Winnibigoshish, Walleyes have decided to play hard to get since the recent cold front swept through the region. Walleye patterns that had been reliable, have been temporarily interrupted while the fish adjust to the new surface temperatures which have plumetted from highs in the 80 degree range, down to the current surface temperatures of 68 degrees. What that means to the fish is sort of a mystery, but it has definitely changed their patterns and even the best anglers are struggling to get into the new groove. 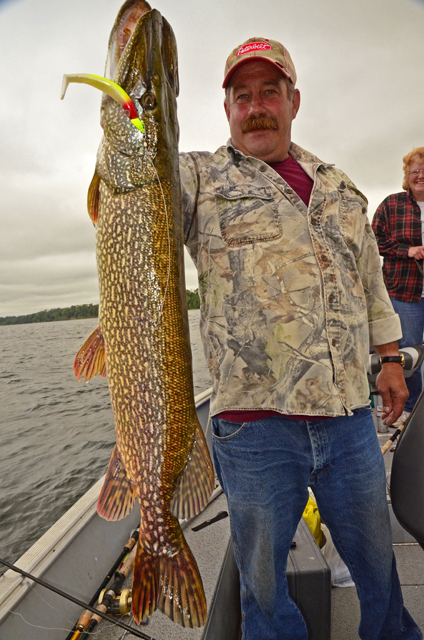 Northern Pike fishermen have had better conditions to work with, but the Pike are scattered too and the anglers who cover ground and fish during "Prime Time" are the ones catching the most fish. Panfish action, especially in Cutfoot Sioux has begun to get interesting. 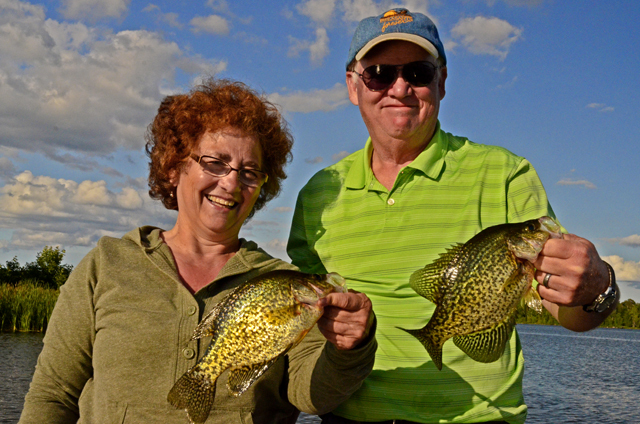 Sunfish have taken too the ... >> Read Full Lake Winnie Fishing Report . (8/3) On Lake Winnibigoshish ; A note from Tom Crosby says; "Winnie is being very stubborn right now, got some on center yesterday today nothing but perch. Fishing Report August 2, 2013 Jeff Sundin - Scattered, Well Fed and Aloof! Is how I found the Walleyes on Lake Winnie this Thursday. One of these days, someone (and I hope it's me) is gonna figure out what happened after the passage of our most recent cold front. Walleyes can't live without eating and I'm not gonna make the mistake of assuming that they're not feeding right now, even at this very moment. But I'm gonna have to admit that wherever they're doing it, remains a mystery for me, at least for today. On Thursday, we fished on both Lake Winnie and Cutfoot Sioux and used spinners in the weeds, rigs on the humps, jigs on the rocks. We trolled, drifted, slipped and hovered. We went shallow, deep and in between and found the same thing almost everywhere we went. Tiny Perch. We did have our moments of greatness though and one of them was a hefty Cutfoot Sioux "Slot Fish" that Carl Casperson caught in 22 feet of water using a Lindy Rig tipped with an air-injected Night Crawler. Another was the nice pail of Panfish that helped save the family fish fry and put grins on our faces as we captured them. All things considered, it was a nice day, a great crew and beautiful weather. Best of all, it gave me enough fish to claim a victory and left me with a goal for the next trip. Fishing Report August 1, 2013 Jeff Sundin - Toothy Critters Are On The Prowl! Welcome to August, a pivitol month of the fishing season and potentially one of the best months for anglers that have a hankering to play with the big boys! 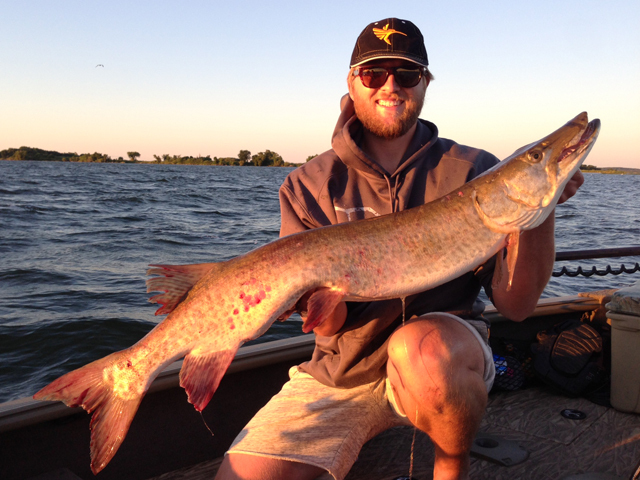 Grant Prokop has been fishing the Musky weeds during the evenings lately and he's been finding them active. Without giving away any of his trade secrets, all we can say is that he's been on more than one lake and the fish are active during the evenings. Prokop's Girlfriend, Erica Winter had catching a Musky on her bucket list for this summer and he was only too happy to guide her to the right spot, where she checked that first one off the list. With a little luck, we'll be getting another report later today. (8/1) At Frontier Sports in Marcell, Paul Larson says; "Well, it’s the last day of July and the fishing in the area lakes has been very good if not stellar! Crappie fishing has been excellent. Most fish are being taken on small jigs with minnows. A slip bobber helps reach fish that are typically suspended about 5 to 8 feet deep,oover water depths of 12 to 16 feet. Walleye are also biting well. It seems the period between 6PM and 9:30PM are the most productive times. They are being taken with a variety of methods. Spinner rigs with Night Crawlers or Leeches, Leeches and a slip bobber and crank baits. When it comes to crank baits, I made a surprising (at least to me) discovery. While trolling for Crappies with the smallest LIVE TARGET Rainbow Smelt, and having great success, I hooked a nice walleye. Going back along the same deep weed edge I hooked another….and another…. and another. It’s been that way for the last three weeks. I even took the little sprite out to a more traditional flat 14 feet in depth and caught a 19.5 and a 22.5 inch walleye and lost several others. The hooks are small on these little lures and I always lose a few, Walleye and Crappie both, but it’s great fun on an ultra-lite outfit. You can expect to catch bass and just about everything else on these lures as well. Fishing has been good for a number of other species like Large and Smallmouth Bass (it’s about Froggin’ time!) and reports of large Sunfish have been coming in. The Pike bite has been slowing down while the Musky fishing is steadily improving. All said and done, it’s a great time of the year to be up on The Edge of the Wilderness! (8/1) From Cutfoot Sioux, Eagle Nest Lodge - Bryan Harris said; "Our folks have still been doing well in Cut foot Sioux, using lindy rigs. The clam bed and Bob's bar have been steady. The battle/see lye bar is super in the evening. We've started to see some decent northerns in the weeds, too. Nothing massive, but worth the tangle. Lots of tiny perch have been pesky in spots. Not too many keepers. Fun for the little kids!" I wanted to try the slip bobber technique in the Fish Ed video that you had recently posted. While I didn't catch a lot of anything, I caught enough largemouth, smallmouth, rock bass, perch, bluegills, and a decent walleye to call it a successful trip. It was a good day to be George! Somehow, George Hauck just knew where to throw the Clown Color Money Minnow. The Pike have been tearing up these tasty treats lately and if you haven't tried them, you should treat yourseld to a new experience. 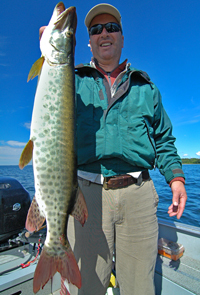 Photo Grant Prokop: Who has been enjoying great Musky fishing on Leech Lake. Pictured is Gabe Wood who caught this one on a .... ooops! I have been told that this is classified information! If you wanna find out, you're gonna have to hop in the boat with Mr. Prokop yourself. 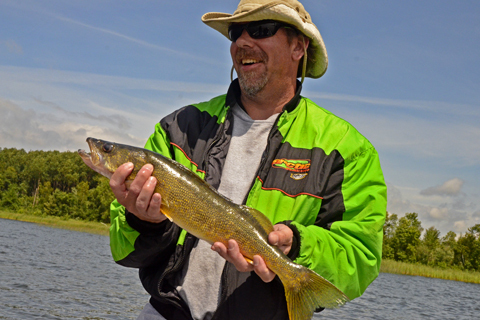 Photo Grant Prokop: On Leech Lake, spend your daylight hours fishing for Walleyes. 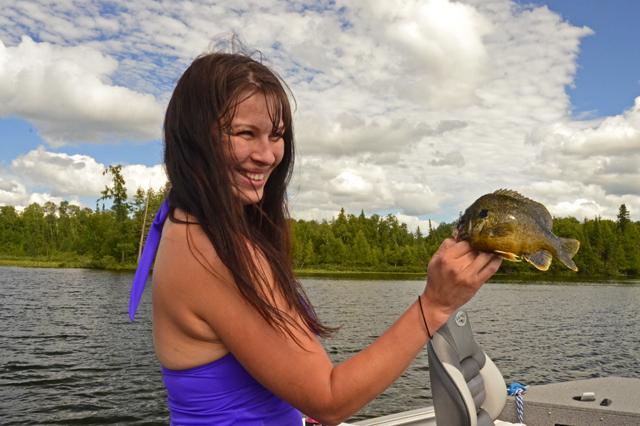 Stephanie Wojton shows off one of her better fish. Pike, Muskies, Walleyes .... It didn't matter. The Biegler Boys were up to the challenge. Both the Musky and Walleye were caught on a 3/8 ounce, Chartreuse spinnerbait. Try something like the BOOYAH Counter Strike Spinnerbait. We didn't add any trailers, but many times the extra bulk helps. Nils and Bjorn Snyder showing off one of their Crappies. With surface temperatures at almost 72 degrees, the weed pattern is going to be solid for the next week or so. If you're not going to catch a lot of fish, then it's a good idea to catch a nice one. At least that's Carl Caspersons idea of a good "Plan B". Fishing in 22 feet of water, using a Lindy Rig and Night Crawler injected with a shot of air from the worm blower helped fool this Cutfoot Sioux Walleye. Now you can achieve the ultimate in boat control because your fish finder and your trolling motor can talk to each other. Photos Courtesy Grant Prokop: (Above) Grant has been fiinding the "Skies" active during the evenings lately. We didn't pry for the names of lakes he's been fishing. But there's more than one, and the musky have been active on all of them. (Below) Erica Winter checked off one item from her bucket list by catching her first ever Musky. Photo Gus' Place Resort: Fishermenhave been able to find some nice Perch on the "inside edges" of the shallow weed lines. Best results have come by fishing in the open spaces with slip bobbers tipped with minnows or cut pieces of night crawler. A sign of days to come. This Walleye is a lot like most other Cutfoot Sioux Walleyes. Except this one was caught on a Lindy Jig and minnow combination. Just think, the fall jig and minnow bite is just a few weeks away and I for one, can hardly wait! Joining us for her annual cameo fishing appearance, Nancy Engler directed us to a new Crappie hole in 17 feet of water at the tip of a submerged point. Using 1/16 ounce jigs tipped with crappie minnows, we caught mainly smaller fish, but there were moments of greatness! In Lake Winnibigoshish, like In many midwest lakes, weeds will grow in ten to twelve feet of water during the warmer months. If you find weeds at a given depth, the can likely be found at the same depth all over the lake you're fishing. He's Back! After spending the weekend taming a mountain of paperwork, fixing some broken stuff and even sueezing in time for a trim; The Early Bird Fishing Guide is back in the boat and ready to rock for the second half of the fishing season. Keep the kids happy and somehow, dad just happens to get some giggles too. Art Krueger shows off a great Smallmouth Bass that he caught while "Uncle-Cousin Matt" snaps Mabel's picture with a Panfish. In between the Panfish and Bass, an occasional Walleye would burst onto the scene. For some strange reason, it was a very good day to be Mabel Krueger! Pictured here with our lunch! Roaming the weedlines using spinners, we found a hodge podge of fish including Bass, Sunfish, Pike and a few Walleyes. Hybrid Sunfish like this one are colorful, plentiful and feisty. Grab the kids and go!